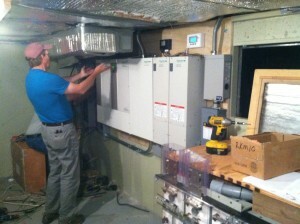 SBS Solar was really excited to work on this bimodal system. It is just a few minutes from downtown Missoula, and the customer wanted to be fully self sufficient when the grid was down. The customer had a slightly higher then average residential load so we sized a 36 module Canadian Solar CS6P 250P for a total of 9 kW system capable of supplying over 10 Mega watt hours annually. 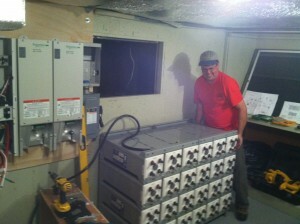 We used eight of the 6 volt Unigy II 1016 amp hour Gel batteries for storage. At over 400 lbs a piece just getting the batteries in the basement was a feat for four strong guys. We were concerned about the end nailed stair treads giving it up with the weight we were applying, but thankfully no issues. 6 volt Unigy II 1016 amp hour Gel batteries for storage, at over 400 lbs a piece! We used the most advanced charge controller on the market (the Xantrex XW MPPT 80 600) capable of converting up to 550 volts DC from the array to battery bank voltages allowing us to use large strings of up to 12 modules in series. This was a huge benefit on this system allowing us to achieve less then 2% loss running four strings of 10 gauge wire on a 250′ home run instead of 12 strings of 4 gauge with a standard 150 volt max controller with a dramatic cost difference. We used two of the Xantrex XW6048 inverters to supply the home, charge the batteries from the generator, and backfeed the utility from the PV Array for a total of 12,000 watts so there is room to grow in the future. The combiners, disconnects, Xantrex XW PDP Power Distribution Panel, and SCP System Control Panel completed the system. The Xantrex XW SCP allowed us to program the inverters and charge controllers to perform the complicated tasks of keeping our batteries happy through all temperatures, feeding critical loads during a power outage, and back feeding the power meter when the grid is up and the sun shining. Our customer shut his power off the first weekend to see how the system would keep up with his usage and was very pleased with the power production. When using the system off grid to power the critical load panel it only pulls as much juice from the array as is necessary to keep up with the loads and keep the batteries charged that weekend he only used approximately a third of his capacity. This was a great system for the SBS Solar to complete, as we finished up just before installing the 22.5 kW Xantrex XW system in Hamilton with 5 times the battery capacity. That post is coming soon! Clean Energy Talk is the official blog of SBS-Solar. 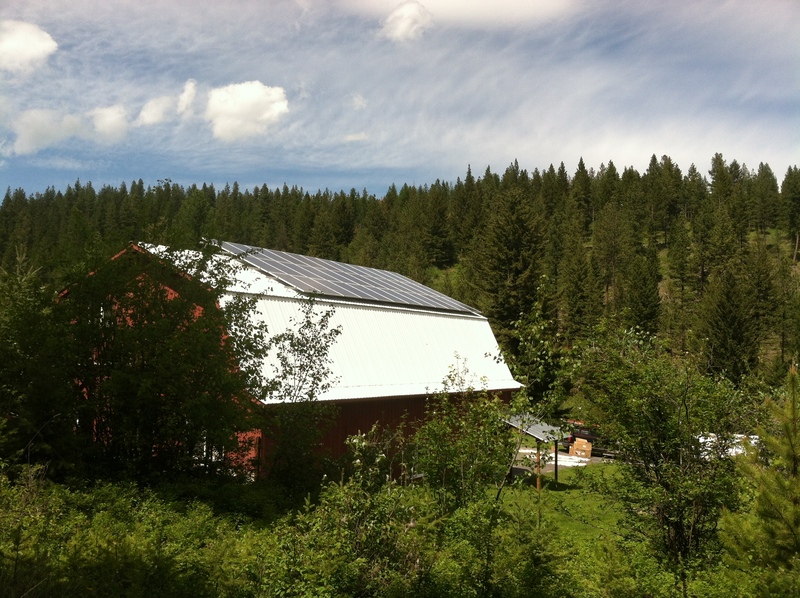 If you like what you read, please subscribe to our blog, "like" us on Facebook, follow us on Twitter, or come on by for a visit to our Solar Showroom in Missoula.